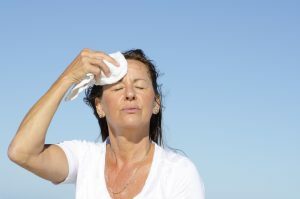 The way that the body responds to external temperature was uncovered in a recent study which looked at how prolonged exposure to high temperatures can raise the core and skin temperature fairly easily. This leads to an inability to exercise for longer periods and reduced the blood flow to the limbs and the brain. Proper blood flow is of paramount importance at all times - especially when exercising. The effects on the skin and the internal effects on temperature are documented in the study. The study follows nine male volunteers who all rode stationary bicycles after being exposed to a hot climate by wearing a body suit that circulated 122 degrees via water filtration. The participants were exposed to the heat in increments of 13 minutes. Another test dealt with 52 minutes of heat exposure where the core body temperature of the participant was increased. Then the researchers took specific tests of blood flow to both the legs and the brain during such exposure. The findings showed that this type of temperature exposure while exercising decreased the blood flow. This obviously impacts the type of workout a body would be able to safely complete. Researchers found that the combination of multiple stressors triggered by whole body hyperthermia, however, resulted in a compromised aerobic capacity. When we truly contemplate the findings of this study, it can't be that surprising. Just as the body reacts poorly to falling below a certain temperature for an extended period of time, it does the same when exposed to high temperatures in conjunction with using the body in a heightened and elevated state. This is likely what contributes to all of the heat warnings that go out in various warm climates. Heat stroke and heat exhaustion are very serious. The body isn't meant to deal with those levels of heat for long periods of time. Even with the aid of water, the body can become dehydrated faster than the water can be adequately replenished. It's also important to note that these subjects were in relatively sound health. It wasn't their lack of health that made their bodies react so poorly to the influx of heat and elevated amounts of exercise, it was the heat itself coupled with the activity. It is crucial that we realize our bodies are not invincible and that we act accordingly. There is no need for us to exercise outside in over 100-degree heat for extended periods of time. This can easily turn into a medical situation waiting to happen, regardless of how fit and in shape you are. Our bodies can overheat, and when that happens, our internal valves and bodily functions may be compromised. This is why exercising in ideal conditions is your best bet. Make sure you are aware of how your body reacts to regular and consistent workouts. Be mindful to avoid the sun or heat for extended periods of time. Make sure you are remaining as hydrated as possible. Do not over-exert yourself or workout too long. Listen to your body and understand the potentially disastrous effects of prolonged heat exposure.